The Grand Daddy of Them All ! Opened in 1864 Saratoga is the oldest racetrack in the country. 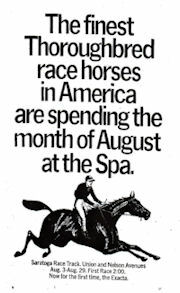 Except for 1911 and 1912 when horse racing was banned in New York it's been "The August place to be". Saratoga Race Track is located across the street from the National Museum of Racing and Hall of Fame. Not without its dark moments Saratoga now survives as an American Landmark. Like Santa Anita, Saratoga is the East Coast site to visit a day at the races from times past. Saratoga has a purse value index of 50. In 2011 a long time has passed since the horses have saddled among the elms, but Saratoga still maintains it charm. As is the norm today Saratoga opened in July running thru Labor Day. Javier Castellano won the riding title and Stay Thirsty captured the Travers. Racing is again on tap for 2012.